In 2004's The Bard's Tale by inXile Entertainment (headed by Fallout vet Brian Fargo), players can befriend a small, seemingly invulnerable dog at the start of the game, at which point the story arc changes: Although the hero must now eventually face the dog's death, he is ultimately reunited with its eternal spirit. In a game that features Jungian archetypes like the Knight, the Brute and the Crone, the Dog in The Bard's Tale's represents many archetypal canine qualities: courage, friendship and, above all, loyalty, a feature intentionally coded into the very first Dogmeat. "Dogmeat did not have any dialogue, so you could not tell him to do anything," says Cain. "What could he offer the player who could choose to take Ian or Tycho instead? Unconditional love. Dogmeat's loyalty to the player was set to 100 percent, and he would never leave you for any reason." Dogmeat's unwavering devotion lets players "Pet the Dog," a fiction trope wherein a potentially despised character appears kinder by demonstrating a love for dogs: In Equilibrium, Cleric John Preston slaughters a dozen policemen to save a puppy; Discworld's Lord Vetinari (veterinary?) is an ex-assassin with dogs named Wuffles and Mr. Fusspot; even Richard Nixon had Checkers. In an uncaring wasteland where you can play a total psychopath if you so choose, Dogmeat is a moral compass: Though your needle might swing towards good or evil, his center always holds strong provided you protect him. If you don't, his death becomes a sad reminder of the consequences of reckless slaughter. 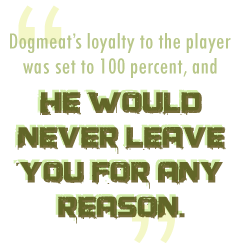 For many reasons, Dogmeat is arguably the most successful NPC companion ever, according to Chris Avellone, Level Designer for Fallout 2, creator of the Fallout Bible and Chief Creative Officer of Obsidian Entertainment, developer of Fallout: New Vegas. "One, he doesn't talk, so the players can project a personality on to him," says Avellone. "Two, he's effective in combat ... and three, he's a dog that stays with you through thick-and-thin. I don't think there's a deeper 'awww' sentiment than people have in their hearts for their pets." Michael Fiegel is a freelance writer and game designer, and the creator of Ninja Burger and HELLAS: Worlds of Sun and Stone. He leaves Dogmeat in Megaton to guard his Bobblehead collection, because it's safer beside the nuclear bomb.